Chlorella is much more than a healthy supplement - it is actually a whole food with a number of potential benefits. * Chlorella has an abundance of chlorophyll - which helps provide magnesium to the body, and increase oxygenation. * Chlorella can increase interferon levels and boost the immune system. * Chlorella can increase cellular glutathione levels and detoxify the cell of free-radicals. * Chlorella has a fibrous wall, which helps chelate to toxins in the blood stream and gut and eliminate them from the body. * Chlorella is full of vitamins, enzymes, minerals and protein - for example, it is an ideal source of natural beta-catrotene (contains both natural forms, cis- and trans-, unlike high street vitamin supplements which are usually just one of these) and natural vitamin B-12. It is rather like an all in healthy natural ’multivitamin and mineral supplement’, with enzymes, proteins and genetic compounds thrown in. It is worth noting that apart from detoxification and immune boosting benefits, there are a few research studies that show it can cause cancer cell death and prevent cancer spread. Now, if you search Google you will find a number of websites praising chlorella to the hilt. And just as many saying there is absolutely no research to support any claims for it. Hopefully, by the end of this piece you will realise the truth about chlorella and judge for yourself how important the research we present is. If you are over the age of 50, or thinking of giving up meat in your diet; if you have cancer, or you are just one of the many people likely to be deficient in B-12 (for example vegetarians), or if you want natural and easily assimilated anti-oxidants, a good source of essential amino acids, enzymes and minerals, you should seriously consider taking Chlorella as a part of your Integrative programme. Chlorella is a wonderful and recognised natural food source. But it is vital that you choose it from a quality source.
" If you are already thinking of supplementing with chlorella, check out the choice that Our Natural Selection has in its on-line shop, by clicking HERE"
Over 30,000 species of algae inhabit the earth, from microscopic blue green algae to giant kelp strands over 120 feet long. Microalgae include blue-green algae such as spirulina and aphanizomenon and green algae such as chrorella and dunaliella. Such algae are found always near a source of fresh water and represent the very first life forms on the earth, some 3.6 billion years ago. Although there has been interest in algae as a food source for over a hundred years, only after the Second World War did this intensify as the Japanese, in particular, looked for ways to feed the nation. Algae can be produced on relatively barren land and at protein levels twenty times higher than soya beans. Most algae have a structure like a virus, being very primitive with no nucleus, but what differentiates Chlorella is that it does have a nucleus which gives it so many of its "extra properties" and in recent years this form has amplified the interest in algae and their benefits. Thus, Chlorella is a unique, single celled, fresh water algae. It is often dubbed, a "pure food" or a "whole food" because it contains vitamins, minerals, amino acids, enzymes and polysaccharides. indeed almost everything you could want in a natural supplement! The vitamins are bio-chelated, which means they are wrapped up with amino acids and so the body assimilates them more readily. 18 key amino acids are present including all eight "essential" amino acids. The enzymes include important digestive enzymes, often used in cancer treatments. The polysaccharides include mannose, arabinose, galactose, rhamnose and xylose (see ICOI April 2003 on Glycoproteins), shown to be crucial in improving the quality of the immune system and the ability of cells to communicate, and hence white cells to "recognise" rogue infiltrators. The DNA content of 3 per cent total volume and RNA of 0.2 - 0.3 per cent means it is nucleic acid rich - good for both growth and anti-ageing. (Dr Benjamin Frank, in his anti-ageing clinic, originally concluded sardines had the highest nucleic concentration but chlorella is ten times their level). Chlorella has ten times the beta-carotene of carrots and is rich in most B vitamins except folic acid, but particularly high in B-12 and so is excellent for vegetarians. You should note that the beta-carotene is available in both its natural forms, whereas the great majority of beta-carotene vitamin pills are synthetic and just come in one of the two forms. Frankly, Chlorella is like a natural multivitamin and mineral, with enzymes, amino acids, nucleic acids and polysaccharides thrown in. Oh, and a few other things too. All rolled into one! Reducing the stresses of life! In another study (European Journal of Dermatology; May.June 2008 ) chlorella was shown to inhibit collagen degradation, mRNA and kinase formation as a result of ultraviolet light exposure. If you are thinking of buying Chlorella, you might like to look at the Natural selection Product of Choice. You can do this by clicking this link. The Journal of Medicinal Food, Sept 2008 includes a study where rats given cadmium had lower levels of liver damage if also given chlorella, indicating its ability to chelate to/bind to heavy metals and eliminate them from the body. Beneficial bacteria supplementation was shown to be a further benefit here. Readers may recall that we covered another study in icon (Journal of Medicinal Food; March 2007 ) where researchers in Japan had concluded that pregnant women taking chlorella had reduced levels of dioxin and IGF-1 in their breast milk. In the June 2008 edition of Food Chemistry Toxicology there is a study showing chlorella binds to and removes lead from the body. Part of the detoxification effect can be ascribed to the fibre in chlorella and its ability to bind with toxins in the blood stream and gut. But research shows the chlorophyll level increases natural cellular glutathione - and this is one of the most potent cellular detoxifiers known to scientists. The detox effect is enhanced in research if the correct levels of beneficial bacteria are present. (If you are interested in taking a multi strained Probiotic, click HERE). Indeed it is so powerful a detox agent that people taking their first doses of chlorella may feel nauseous, faint and lethargic. If so, you should stop and re-start on half a dose. There are also clinical trials showing that properly-stimulated beneficial bacteria can actually heal damaged gut linings and help in diseases from Crohn’s to IBS. Apart from its benefit as a food, there are numerous studies, largely emanating from Japan (e.g. Sarkar 1994 or Hayatsu 1993 or Konishi 1990), which show chlorella to be a strong booster of the immune system. In particular chlorella increases interferon production which in turn stimulates macrophages (the "digesters" of rogue cells) and T-lymphocytes (the identifiers of rogue cells). Not surprisingly several studies show that it combats infection (e.g. Konishi). It has also been shown in Japanese research to promote growth in children and to be a strong aid to tissue healing. Since chlorella is proven to increase the white cell content of the body, it may help in the fight against cancer. Certainly Professor Randall Marchant of Virginia Commonwealth University and a Neurologist looked into the effects of chlorella with brain tumours as early as 1986 and concluded it boosted the immune response significantly. (In a clinical study in 2008 he also concluded that chlorella could regulate genes involved in diabetes). In 1998 a study in Cancer Immunology and Immunotherapy journal showed that chlorella had anti-cancer properties with an extracted protein inhibiting cancer spread in mice. A second study in 2009 (Journal of Zhejiang University-SCIENCE B) which concluded it had definite anti-cancer properties. In this case it was with rats which had been given liver cancer. The chlorella triggered cell death. In a 2010 study, a hot water extract of chlorella induced apoptosis in liver cancer cells. The results were dose dependant (Clinics (San Paulo) 2010 65 (10), 1371- 7). The detoxifying ability has been shown in research to help during and after chemotherapy. Do we think it is a cancer ’cure’? No. At CANCERactive we think no single compound (Drug or natural) is likely to be a cure for cancer. However it may be useful as part of your overall programme. Its benefits increase significantly where the body has a healthy natural flora balance in the gut. Chlorella stimulates the growth of certain beneficial bacteria and its benefits are in turn enhanced by beneficial bacteria.Taking chlorella and a good quality multi-strain probiotic has a particularly powerful synergistic effect. Clinical trials show that chlorella and beneficial bacteria, properly stimulated, will chelate heavy metals, nitrosamines and oestrogenic products helping their elimination from the body. Correct levels of beneficial bacteria will also aid production of cancer fighting vitamins such as B-12 , biotin, folic acid and vitamin K from the greens. So chlorella is, quite simply, an excellent way of delivering important vitamins such as B-12 into your blood stream. This is very important in the cancer fight as estimates suggest 50 per cent of cancers are associated with poor diet. For example, women with breast cancer have been shown to have a deficiency of vitamin B-12. This is exacerbated if they then decide to ’Go vegetarian’ as part of their treatment programme. 70 per cent of Vegetarians are deficient in B-12 as it chiefly occurs in meat. Chlorella (and probiotic strains) can help significantly. Vitamin K has been shown to stop liver cancer in research studies in Tokyo and Washington. And you can only get your vitamin K naturally from green foods and the action of beneficial bacteria on them causing its release. Following a paper by Waladkhani and Clemens in 1990 (Effects of dietary phytochemicals on cancer development) there has been increasing interest in the benefits of chlorophyll in general in the cancer-fighting process. Algae, chlorophyll, chlorella and other such elements have all been tested as agents for use with photodynamic therapy, largely by the Russians. The chlorophyll molecule is structurally very similar to the haemoglobin molecule, but whereas haemoglobin has iron at its centre, chlorophyll has magnesium. When light shines on chlorophyll it emits oxygen, the basic system of photosynthesis. These facts mean that firstly chlorophyll is relatively free to travel round the blood system non-toxically because of its resemblance to haemoglobin; and secondly, in the presence of light, it produces oxygen - the very substance that cancer cells hate. The ’sun belt’ across America has been shown to be a region of less cancer. The population consume higher levels of ’Greens’ and the sunshine gives them higher levels of vitamin D. Moreover, in a land where 40 per cent of the population has magnesium deficiencies, the people of the sun belt do not. And magnesium is linked to correct mineral levels inside the cell and its power stations, the mitochondria. Incorrect mineral levels (e.g, too high a sodium level, too low in potassium) is linked to cancer. Certainly, there is a lot of well documented evidence from the Far East on the benefits of eating green vegetables for diseases such as colon cancer, or for increasing levels of phytoestrogens, and their protection against hormonally induced cancers like the oestrogen-driven breast, ovarian, prostate, womb and brain cancers. Chlorella helps purify the blood and is a particularly good detoxifying agent; it can help detox heavy metals, for example mercury, and pesticides from the body and is recommended in a number of detox diets. As we said above, this is enhanced if the correct levels of beneficial bacteria are present. Indeed it is so powerful a detox agent that people taking their first doses of chlorella may feel nauseous, faint and lethargic. If so, please stop and re-start on half a dose. This first form of life on earth will also aid your acidity/alkalinity balance. And most patients with cancer have acid bodies, where nature intended us to have alkaline ones! Chlorella is known to increases the rate of multiplication of lactobacillus in the gut aiding, for example, your digestion. There are also clinical trials showing that properly-stimulated beneficial bacteria can actually heal damaged gut linings and help in diseases from Crohn’s to IBS. 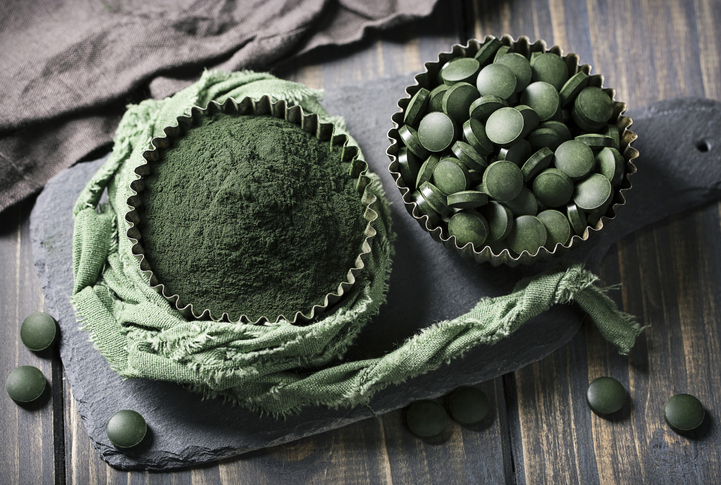 How do you find Chlorella you can trust to be of the highest quality? Its not easy. The best forms should never be freeze-dried. And they should obviously have no additives or preservatives. After all this is a NATURAL FOOD. If you are looking to buy an all-natural, chlorella meeting these high standards you might want to look at the Natural Selection site. You can click here. Chlorella should be taken daily and ideally combined with a multi-strain probiotic. Natural Selections Product of Choice Chlorella is excellent value as it gives you all these natural vitamins, minerals and enzymes in a three month’s supply. Frankly, three months is the recommended period to take this and really feel the benefits. Storage is crucial as oxygen and light can cause this natural and "live" food to become unstable. You will find Natural Selection’s in resealable special packs. Chlorella should be taken with meals, breakfast, lunch and dinner (about 4 small pills each time). It really is the natural way to a multitude of beneficial natural compounds. At Last - the definitive, research based book on how to build a diet to help beat cancer. Click here to read about it.